This was my first flight on a Dreamliner and the aircraft for my flight is brand new – with just the flight from Boeing’s Seattle headquarters under its wings. Business Premier features 18 seats configured in three rows of one in a herringbone style. The gorgeous pale leather seats are extremely comfortable, with a black leather ottoman that becomes part of the flat-bed when time for a nap. There is a very large table that slides up and out from a clever compartment in the side wall, storage for phones or passports under the left armrest, and as soon as I have stored my bibs and bobs in the various hidey holes, I am straight onto the entertainment system to watch a movie. The gate-to-gate system is exactly that, meaning you can watch movies or tv shows from go to whoa. I choose Adrift, and don’t even mind when the air safety video comes on because, it’s Air New Zealand and their safety videos are top of the class. We are mid ocean, both in the flight and in the movie, when lunch arrives. I chose and entrée of seared beef eye fillet with skordalia, green beans cherry tomato, almonds, and salsa verde with a main of lamb shank in red wine with chorizo and rosemary barley risotto roasted carrots and lamb jus. Consultant Chef, Peter Gordon, outdid himself as the lamb shank was divine. As for dessert, the passion fruit and lemon curd ice cream with mango sauce and lemon meringue is dreamy. 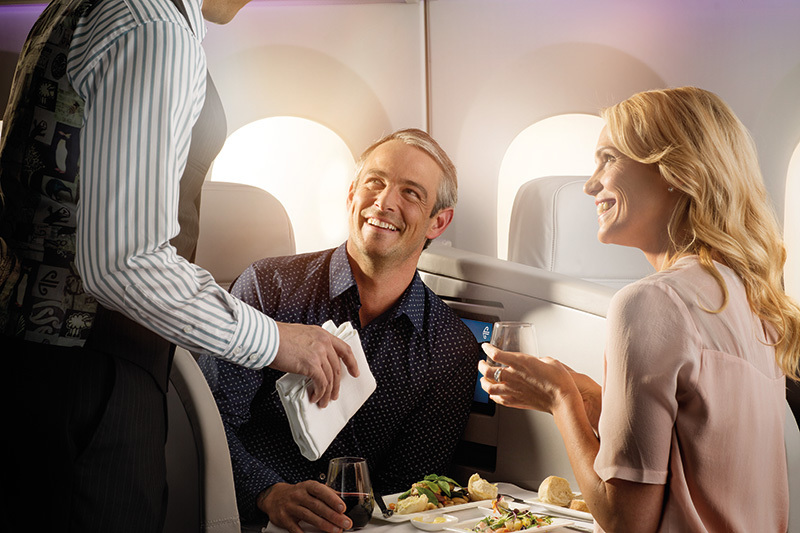 The verdict: Air New Zealand does it so well, with the service, meal quality and the rarefied purple-lit Business Premier cabin absolutely fabulous.